Jewellery - something which always charms us - has a great economic significance in the Indian Industry and is regarded as a major source of investment. Women has always had an affinity towards jewellery and Indian women has adorned herself with precious jewellery, gold and diamonds to enhance her feminine beauty from time immemorial. India, is the biggest consumer of gold with 20% of world gold consumption and this industry gives employment to millions of people. Indian jewellery industry is said to have an ancient and historical tradition of over 5,000 years with its own distinct designs, patterns and art forms. For centuries, the art of making jewellery has been the monopoly of traditional 'kaarigars' or goldsmiths who have inherited the expertise from their ancestors and have played the dual role of designer and manufacturer. During those days, jewellery designing as a career had been limited to the kaarigars and one could learn this profession only by becoming an apprentice to an experienced jeweller. But today with the explosion in the fashion and accessories arena, the field is becoming a lucrative career which offers a sparkling future for those who are fascinated by gems and jewellery. A new breed of jewelry designers and professionals like gem appraisers are in great demand with the growing market for branded ornaments. Jewellery designing is an art of designing and making jewellery, stone cutting, engraving and polishing etc. Jewellery designers are those who plan the style and pattern of jewellery, silverware and other decorative metal work products. 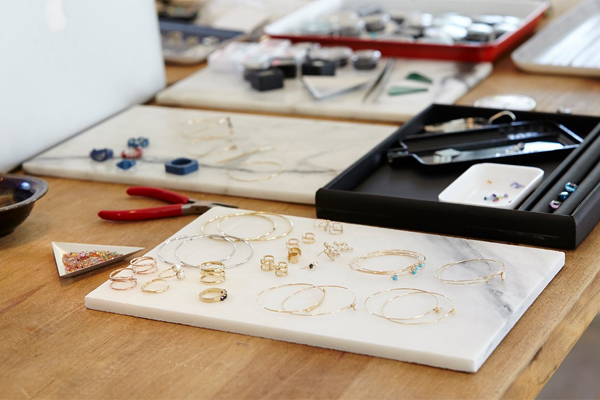 They require a high degree of skill and precision and use a variety of specialized hand tools and equipments to design and manufacture new pieces of jewellery. In addition, to be successful in the field they should be able to understand the market, identify the consumer needs, visualize ideas to suit the demands and create impressive presentations to communicate the end product to the client. The fast growing jewellery business in the country has tremendous employment potential and offers excellent career opportunities to professional executives in the industry. Graduates with specialization in Jewellery Design and Management are in great demand globally for managing the jewellery business.